Age Limit: (As on 01-04-2015) Not below 21 years and not above 30 years as on 01.04.2015 i.e candidates must have been born not earlier than 02.04.1985 and not later than 01.04.1994 (both days inclusive). Relaxation of Upper age limit as per rules. Educational Qualification: Any Graduation in any discipline from a recognized University or any equivalent. How to apply: Candidates will be required to register themselves online through Bank’s website www.statebankofindia.com or www.sbi.co.in. After registration candidates are required to pay the requisite application fee through online mode by using debit card/ credit card/Internet Banking. 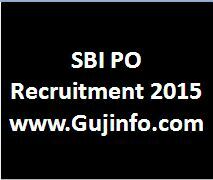 As per the SBI PO 2015 Recruitment Notification any graduate candidates can apply for this post. SBI PO Recruitment 2015 Online Application availble on www.sbi.co.in. Get more details regarding age, qualification, selection, how to apply are given below link.